September 11 is now known as a key date in the nation’s history. September 10 is also a key date, a day when the nation’s fate was determined by the courageous actions of Commandant Perry. However, September 10 now gets much less attention as a memorable date than September 11. In the first decade of the Nineteenth Century, the British sought to dominate and control United States shipping since they were not ready to treat their former colony as a fully independent nation. In 1807, the British Parliament adopted a measure known as “Orders-in-Council” and then amended it. It sought to prohibit neutral nations such as the United States from trading with most of all nations in continental Europe. At the time, the British recognized that they might soon be involved in a European war and did not want the Americans to provide goods to their potential enemies. In essence, the British sought to control American trade with Europe. The British Navy also frequently boarded American ships and impressed men into service with Her Majesty’s Navy. The British Navy had a very difficult time staffing their vessels and forcing men into service was not rare. In some cases, the British captain may have argued that American-born sailors were still British subjects. For these and a variety of other reasons, President Madison thought that the United States should declare war on Britain. He met strong opposition in the United States Senate from New England representatives whose constituents profited greatly from international trade, even if their options were sometimes constrained by the British. Nevertheless, the Senate voted to approve a war by one vote, and on June 18, 1812, Madison signed the measure that started the conflict that was to last two years. Had the United States been overwhelmingly defeated, the American experiment in democracy may have ended. Commandant Perry assured that did not happen. President Madison knew that the British were devoting much of their military to the European theater where they opposed Napoleon and the French. The British had no more than a small military presence in Canada. Madison also assumed that if they Untied States invaded Canada, many citizens of that nation would join the invaders to overthrow British rule. Madison thought that once the United States had taken Canada, Britain would quickly sue for peace since their real interests were focused upon Europe. Madison believed that the British would give into American demands in exchange for a return of Canada to British control. Madison’s plan called for US forces to invade Canada in the summer of 1812 from Detroit, across the Niagara River and from Ogdensburg in upstate New York. Things went very badly for the Americans in the summer of 1812. Michigan Territorial Governor Hull reluctantly led a small force into Canada in August, but very quickly retreated and surrendered Detroit to the British—without a fight—on August 16. For that decision, he was court martialed and then ordered to be hung, but President Madison eventually commuted the sentence. Rather than fighting, the British and American commanders in the Niagara Frontier region signed an armistice. And American forces made little progress in upper New York State. President Madison’s strategy for the War of 1812 seemed to be failing. The British Navy was the dominant military force in the world at this time. The English really did rule the waves. In the spring of 1813, the British and Americans both realized that control of Lake Erie would be a key component of the war. Both sides began building ships: the British at Chatham, Ontario on the Thames River and at Amherstburg and the Americas at the former French fort at Presque Isle near Erie, Pennsylvania. 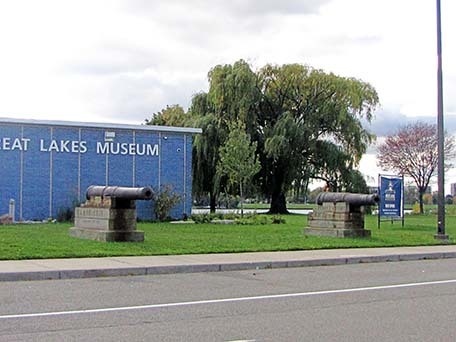 By July of 1813, both sides had modest fleets sailing Lake Erie looking for the opportunity for a decisive battle. The occasion developed early in September. The American commander, Oliver Hazard Perry—who had gained battle experience in the First Barbary War and then fought again in the Second Barbary War—had his ships in harbor at Put-in-Bay on South Bass Island. The British fleet, led by Captain Robert H. Barclay, consisted of three larger boats, Detroit, Queen Charlotte, Lady Prevost and three smaller ones: Hunter, Little Belt and Chippeway. Commandant Perry’s US fleet consisted of two large vessels: Lawrence and Niagara and seven smaller sailing ships: Trippe, Tigress, Porcupine, Ohio and Scorpion. On September 10, Perry realized that the British fleet was nearby. He decided to attack. In the midst of the naval battle, the British knocked out the guns on Perry’s flagship, the Lawrence. Perry immediately rowed through gunfire to another of his ships, the Niagara whose guns carried the day for the Americans. The British fleet was captured and the Americans controlled Lake Erie. General William Henry Harrison led American forces who effectively dominated the British troops on the land. The British burned much of Detroit when they evacuated the city on September 27. On October 5, the Americans won the decisive Battle of the Thames in Ontario pretty much ending the British military threat in this theater and resulting in the death of the powerful Chief Tecumseh. This, in turn, minimized the Indian collaboration with the British. 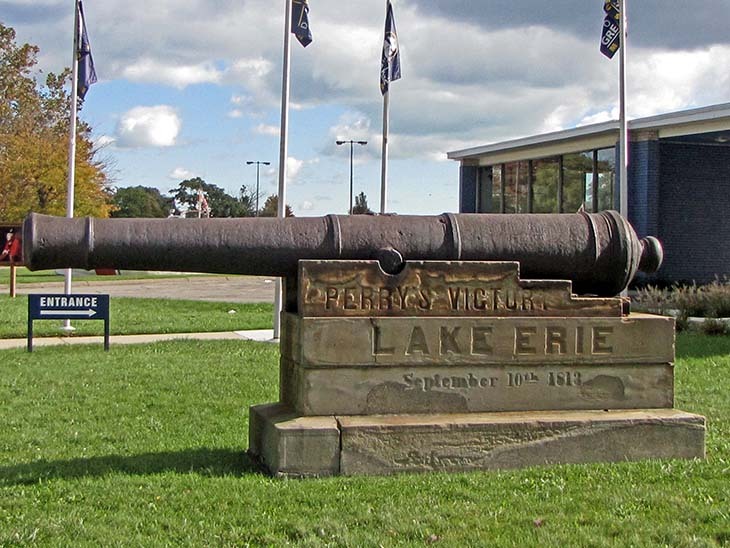 In the Battle of Lake Erie, the British not only lost their ships, but of their crew of 347, 41 were killed and 94 wounded. I believe that Commandant Perry led about the same number of men. His crews lost 29 while 96 others were injured in the fighting. The British and Americans continued to fight throughout 1814 with neither side winning key engagements. Both sides grew tired of the bloodshed that seemed unlikely to produce a winner or a loser. On December 24, 1814, Britain and the United States representatives agreed to a Treaty of Ghent ending the war. News traveled very slowly at that time so the famous Battle of New Orleans was fought in January, 1815, about three weeks after the war ended. Long before the treaty was signed, the British suspended their Orders-in-Council and, eventually, stopped impressing United States sailors. If Perry had lost the Battle of Lake Erie, the British would have controlled the Upper Great Lakes and may have gained much support from Indians. There was considerable opposition to the war along the East Coast. It is possible that a massive defeat on Lake Erie would have prompted President Madison to seek peace on terms the British dictated. Given their military obligations in Europe, it seems unlikely that the British would have sent enough forces to recolonize the United States but that might have been possible. Use in 2013: Military commemoration. 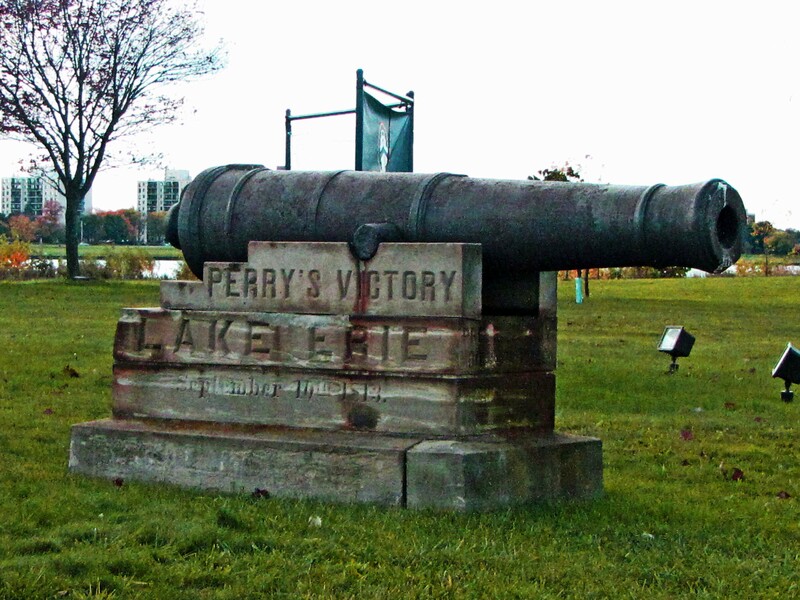 State of Michigan Registry of Historic Sites: These canons are on Belle Isle, P25,026, listed September 10, 1979.